Virgin Care has won a £280m contract to run NHS healthcare for frail and chronically ill people in the Midlands, it was revealed today. Virgin Care have won a £280 million contract to run NHS healthcare in East Staffordshire, it was revealed today. Virgin will now provide (or sub-contract to other providers of its choice) healthcare services for 6,000 frail elderly people and around 38,000 people with long term conditions such as diabetes or heart disease. The decision - along with other big pre-election privatisations - appears to contract David Cameron's pledge in November 2014, when he told the BBC "It's our National Health Service. It's in the public sector, it will stay in the public sector. That's not going to change." "This is yet more evidence of the increasing privatisation of the NHS which adds weight to the findings of a recent BMJ editorial, which quoted research from Oxford Economics showing that in the first 3 years of the coalition, the value of outsourcing had increased from £6.9bn in 2010 to £12.2bn, equivalent to 10% of the NHS budget." Local health commissioners, East Staffordshire CCG, explained the decision, telling the Health Services Journal that without the contract it would be unsustainable by 2018 and overspend its allocation from NHS England by £10m. The decision follows a KPMG report highlighting the ‘distressed local health economy’. Quite how Virgin will deliver the service cheaper than the NHS is unclear. Although separate from the £1.2 billion contracts to deliver cancer and end of life care across the rest of Staffordshire, details of which were leaked to openDemocracy last week (the larger part of which, Virgin is also bidding for), the contract is another of the new ‘prime provider’ contracts. As we exposed last week, the ‘prime provider’ model typically allows the winning company a remarkable amount of leeway to choose what services will be continue to be provided to patients, to what standards (using a vague ‘outcome-based’ model), and whether it provides these services directly or sub-contracts them to other organisations of its choice. Virgin already operates 30 primary care services across England (often hidden under the NHS logo) including GP practices, GP out of hours services, walk-in centres, urgent care centres (UCCs) and minor injury units (MIUs). Their ‘Urgent Care Clinic’ in Croydon was last year criticised by official inspectors for putting patients at risk by using receptionists with minimal medical training to assess how unwell arrivals were. Campaigners have already voiced concerns about what the privatisation announced today will mean for frail elderly patients in East Staffordshire . “There can only be one reason for doing this, which is that it is believed that despite the fact that Virgin will want a reward for its work they can deliver the service cheaper than the NHS can. That is only possible if services, wages or quality are cut. There is no other option…the NHS is as efficient as any large, complex organisation dealing with polysymptomatic health problems can be. It is only by pretending that the complexity will disappear that Virgin can claim otherwise. The issue of tax avoidance by private firms taking over parts of the NHS is also becoming increasingly sensitive as the scale of the NHS financial crisis mounts. 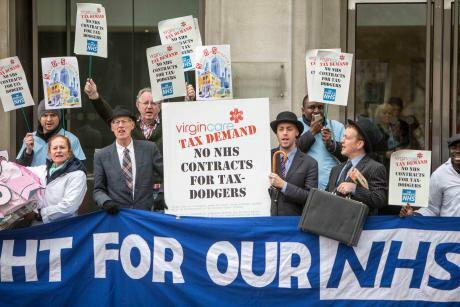 Unite’s research reveals how Virgin uses 13 intermediate holding companies to distance the firm’s healthcare division from its parent company, based in the tax haven of the British Virgin Islands. Today the Kings Fund released a report showing how waiting times are at their highest for years and criticising all parties for not showing how they would plug the £2bn NHS funding deficit the Kings Fund has identified.